I like Norman Davies. I really do. 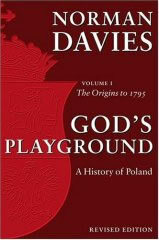 So, when I saw the first volume of his God's Playground - A History of Poland, I didn't hesitate long. I vaguely remember the book causing a stir in Polish academic press when it was republished shortly before I moved to Ireland. I can't recall any details, but the discussion was lively enough for the title to firmly lodge in my brain. I was on the lookout ever since. Veni (to the library), vidi (on the shelf), legi (doesn't sound as fancy as Caesar's famous quip, but means 'I read'). I started to fume and froth right at the preface. Written for the original edition in 1979, it was full of irritating remarks about Poles being unable to accept objective scholarship. Oh, all right, Davies didn't use exactly those words but the message was clear - we are so in love with our version of national history that we throw a fit if anyone dares not to express absolute adoration of Polish heroism. Arrrgh. Sure, Polish nation does include total nutters who will swear that white is black and black is white as long as it fits their political agenda. But generally speaking, we are fairly sane. I didn't find God's Playground objectionable at all (preface aside). It's a reasonably balanced view of Polish history, set against the background of European development. I wouldn't say it's the ultimate book on the subject, but seen as 'a history' it is a really good title: readable, comprehensive and full of interesting trivia. I am deeply fascinated by how nation's own (any nation's, not only Poland's) history compares to an 'international version' (if such a thing exists at all) and here I had a chance to study the phenomenon in depth. Davies is not half as blasphemous as he seemed to have thought in 1979. His view of history (at least up until 1795, when this volume ends) pretty much agrees with what I was taught at school. It is focused somewhat more on relations between Poland and other European states rather than on internal affairs, but that's an advantage, not a fault. Inevitably, it is entirely innocent of any patriotic propaganda, but again - that's a huge bonus. Jingoism is not what I look for in a history book. Actually, Davies seems rather kindly disposed towards Poland. I was honestly enchanted by his surgeon metaphor employed when he was writing about partitions of the country in the 18-th century (read the book if you want to learn more, I wouldn't want to spoil the fun). He translates pieces of Polish Renaissance poetry himself, with some skill, and generally appears passionate about his subject. Result: sound research presented as highly readable book. Can you ask for more?